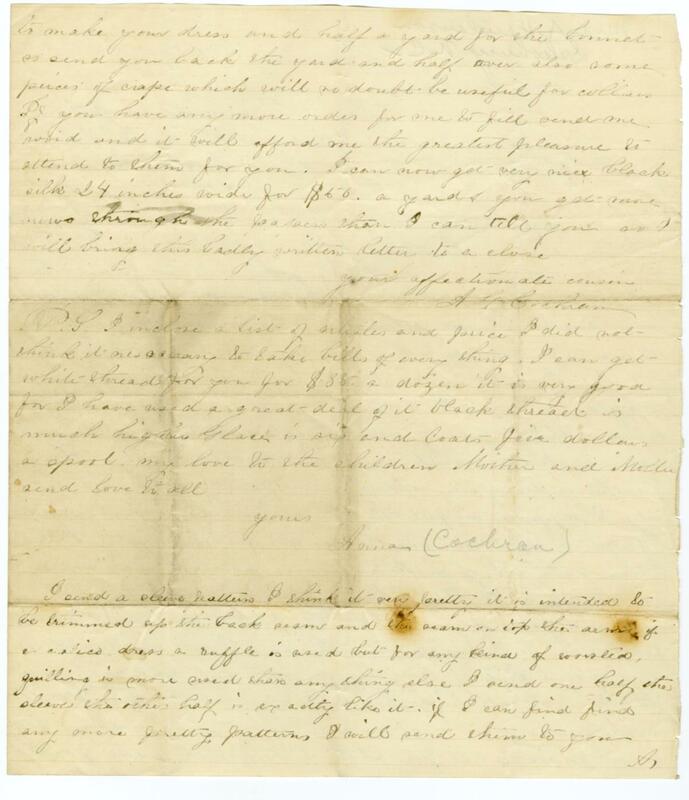 Item Description: Letter dated 15 October 1864 written by Anna Cochran to her cousin. She mainly writes about clothing. Item Citation: Folder 36, John S. Henderson Papers, #00327, Southern Historical Collection, Wilson Library, University of North Carolina at Chapel Hill. I have at last succeeded in getting your things prepared for you. I had your dress made by one of the most fashionable dress makers in Richmond, and hope it will suit you it has been very much a admired by every one that has seen it; your bonnet I had made by my milliner it is in the latest style which I do not admire it is too close on the sides I have got you dresses from dyes. I think they are alone very nicely, your gloves & ribbons are in Richmond not sold yet- it is almost too early in the season for people to begin to buy their winter trimmings yet but I think they will sell very well if you want any silk, gloves, or any other little things let me know and I can send them to you by letter or father will be going ? again in about a month and can take them to you. The weather is dreadfully cold. I am sitting by a large fire now I suppose we feel the change more as it was so sudden I forgot to say your shawl was not finished yet.- I am learning the art of making gloves and have cut out some for myself & Mother. I am going to take the liberty of asking a favor of you Mother has plaited me a hat and feathers are very much worn this fall I am very much in want of some and if you have any old ones and will give them to me I will be a thousand times obliged almost any color will answer and will make you a pair of gloves and send you in return. I almost forgot to tell you that it only look eight yards to make your dress and half a yard for the bonnet so send you back the yard and half over also some pieces of crape which will no doubt be useful for collars. Do you have any more orders for me to fill send me word and it will afford me the greatest pleasure to attend to them for you. I can now get very nice black silk 24 inches wide for $50 a yard you get more news through the papers than I can tell you as I will bring this badly written letter to a close. I send a sleeve pattern I shrink it very ? it is intended to be trimmed up the back seams and the seam on top the arms if a calico dress a ruffle is used but for any kind of ? quilling is more used than any thing else I send one half the sleeve this other half is exactly like it- if I can find find any more pretty patterns I will send them to you. 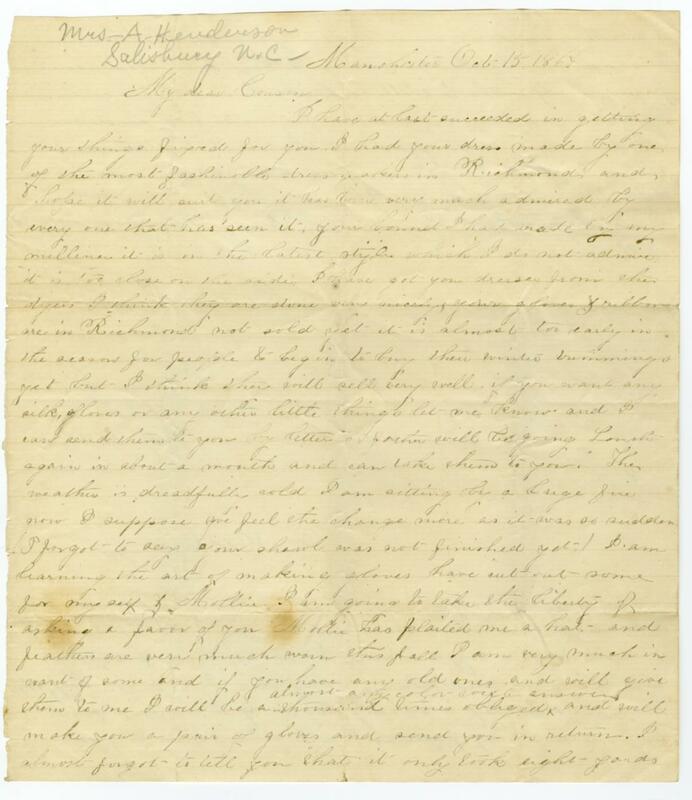 This entry was posted in Southern Historical Collection and tagged Anna Cochran, clothing, John S. Henderson Papers. Bookmark the permalink.